Photo taken at Monmouth Council Merit Badge Show in Asbury Park. Date? Probably in 1947. 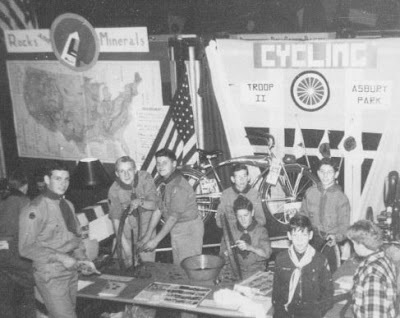 My booth which I set up by myself as a Lone Explorer Scout was next to the Cycling Merit Badge booth. Little did I know then the role Cycling would have later in my life. It seems all children in grammar school somewhere along the line are exposed to dinosaurs and fossils. When I learned that one could find fossils in coal I took it upon myself to look for such in our coal bin at home since our house was heated with a coal burning furnace. After several hours of sitting on the coal pile and examining hundreds of chunks of coal I had a few nice specimens of ferns. I also had some VERY dirty clothes and badly needed soap and water myself. Therein began my collection of fossils, rocks and minerals. A year or so later I spotted an interesting rock in an empty lot not too far from our house in Irvington, New Jersey. It had impressions of shells on it. As I recall, the rock was about six foot long and about two foot wide. I did not know how deep into the ground it extended. With a big hammer and chisel I broke off a piece and took it to the Newark Museum in Newark, New Jersey. Someone on the staff identified it as fossiliferous sandstone containing brachiopods.’ In 1943 I donated that specimen to the museum and shortly received a note of appreciation with an indication where my donated rock was now to be found on display. Woopee! At age 13 I had my own fossil discovery on display in a real museum with my name on it! With that I started collecting rocks, minerals and fossils in earnest. When at Philmont Scout Ranch in 1946 I collected all the rocks I could and ended up with a knapsack with 34 lbs. of rocks which I ended up shipping home to Manasquan from the scout ranch. In Manasquan High School I built my own beam balance and jolly balance to ascertain the specific gravity of minerals. I studied how to use the Bunsen burner and various reagents to test for the chemical content of minerals I was analyzing. In school I took on the role of maintaining a science display in the school library. One of my teachers was taking Saturday classes at Rutgers University and I would ride with him there from time to time and then spend the day in the museum. Not being shy I soon got to know a number of the staff. Before long I was borrowing material to take back to Manasquan High School for display in the library. Not satisfied with that I would take the Jersey Central or hitch hike to New York City and spend delightful hours visiting the laboratories and offices of staff that were ‘behind the scenes’ at the American Museum of Natural History. I would gain access to the staff scientists’ offices by taking a fossil or mineral specimen that I wanted help identifying. It worked and I am sure I became a real pest up there. 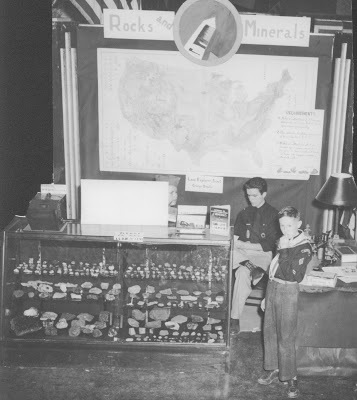 Once I took my collection of rocks and minerals to a Boy Scout Merit Badge Exhibit held in Asbury Park, probably in 1947. 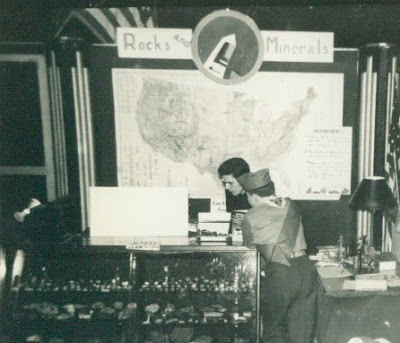 There I had my own Rocks and Minerals Merit Badge booth next to the Cycling Merit Badge booth. It was a job to get that display case to the show but somehow I was able to con friends into letting me put it on their truck and get it there and back. I also had my collection of skulls, pressed flowers, woods (tree cross sections), shells, Indian arrow heads, plaster of paris casts of wild animal foot prints, butterflies, natural and man made textile fibers, beetles and whatever else caught my fancy. I had my own museum in the attic of our house. It was fun, educational and a great hobby. For the most part my collections were based on things that I could collect myself in their natural environment. I probably could identify every wild flower within 20 miles of my house, knew where to look for arrow heads, fossils of various sorts, etc. That is how come I got the job as Nature Counselor at Camp Cowaw at the Delaware Water Gap in 1948. There I collected snakes. Lots ‘a fun. When I graduated from Manasquan High School in June of 1948 I donated most of my natural science collections to the school for use of other students.